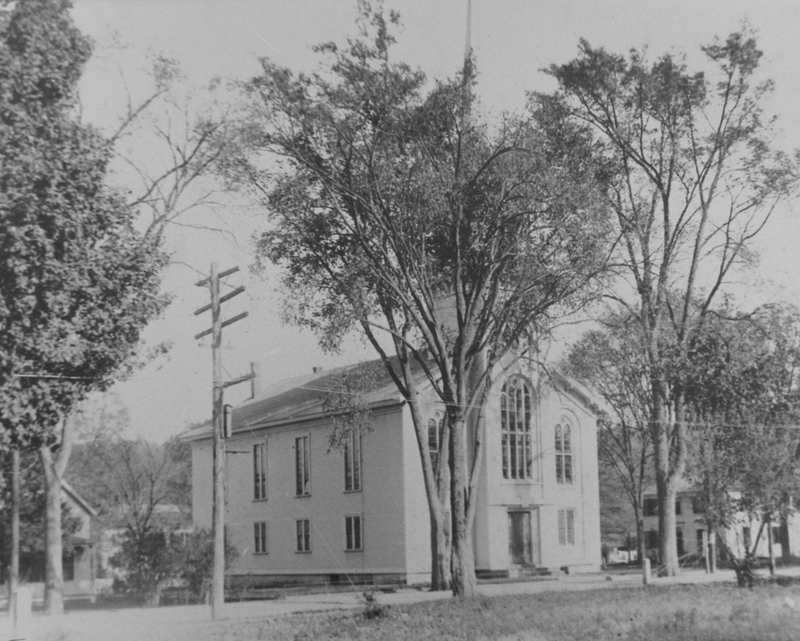 Another view of the Methodist Church on Main Street in Monson, around 1900-1920. Image courtesy of the Monson Free Library. 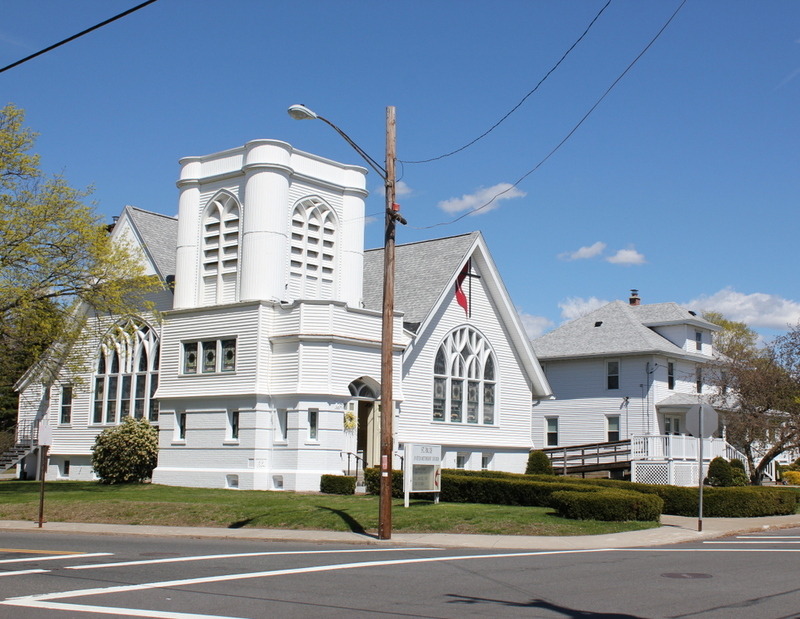 As explained in the previous post, this church at the corner of Main and Cushman Streets was built in 1850, and it is the oldest of Monson’s four church buildings. The only major change in the church’s appearance between the two photos is the steeple. The top of the steeple above the belfry was removed in 1952 because of damage caused by the 1938 hurricane, and it was replaced in 2010. Aside from that, though, the rest of the historic church is essentially unchanged, and it is an excellent example of mid 19th century New England church architecture. 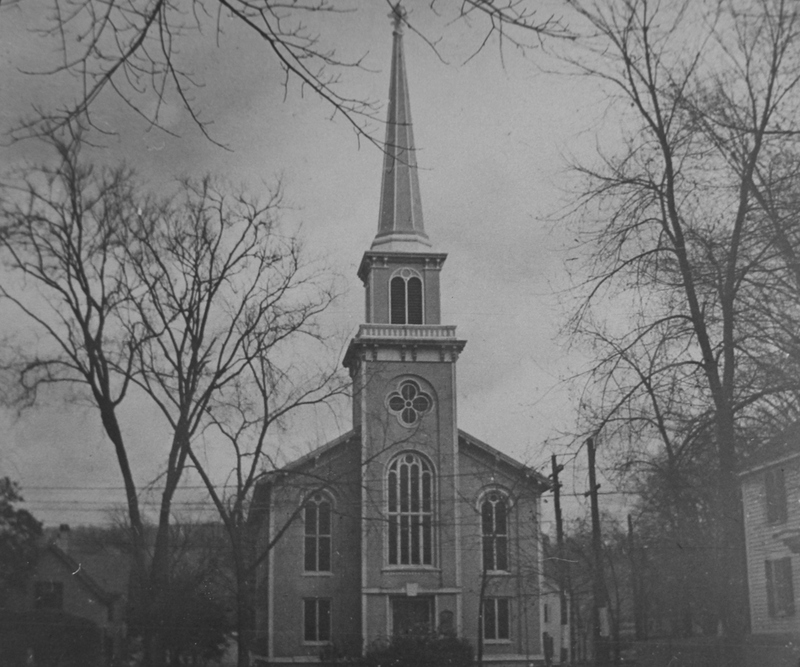 The Methodist Church on Main Street in Monson, probably taken around 1900-1920. 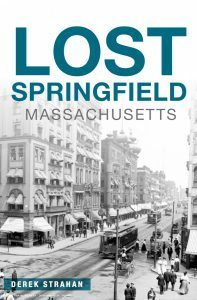 Image courtesy of the Monson Free Library. 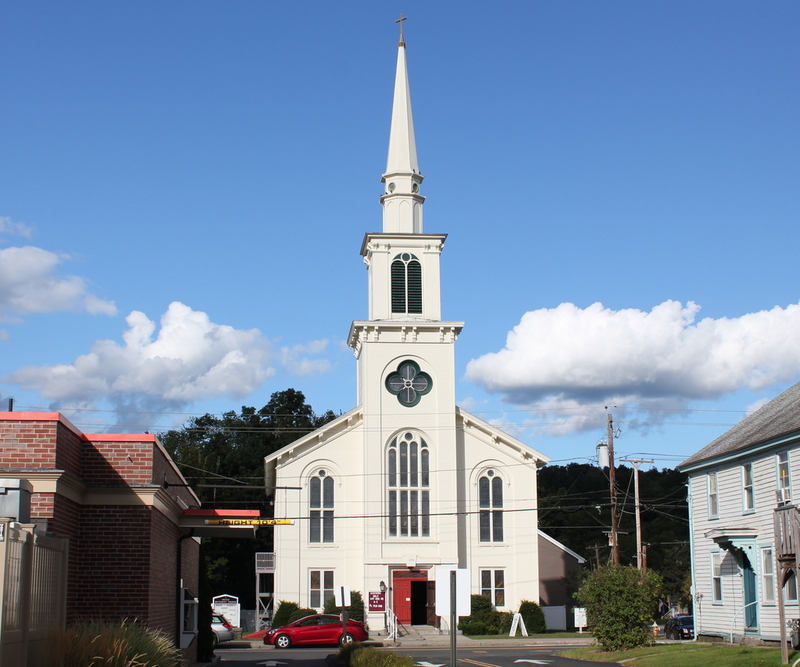 The Methodist church in Monson was first established in the 1820s, and in 1827 its first permanent church building was built about a mile south of here, at the corner of Main and Maple Streets. However, the congregation outgrew that building, and in 1850 they moved to this much larger, more centrally-located church in downtown Monson. As seen in the two photos, it is still standing today, and it is the oldest active church building in town. Architecturally, the church strongly resembles the traditional New England churches of the early 1800s, but there are also some elements of Gothic Revival architecture, such as the arched windows and the quatrefoil window on the tower. Since its completion, there have not been many major changes to its appearance. Aside from an expansion around 1860, the only major change has been the steeple. The 1938 hurricane weakened its supports, so in 1952 the spire was removed, and was not replaced until 2010. Just a year later, a tornado caused severe damage to downtown Monson, and destroyed the steeples of two nearby churches, but this church survived largely unscathed. 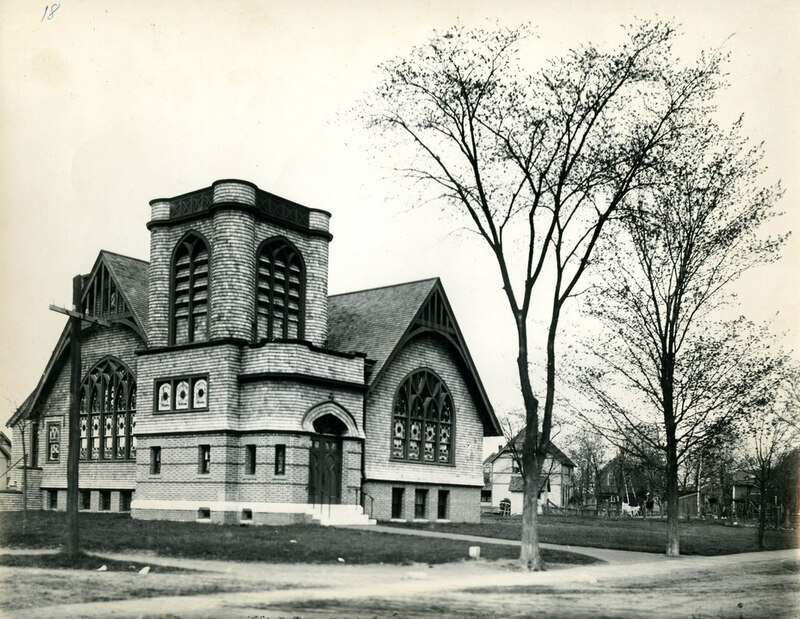 Saint Paul’s Methodist Church, at the corner of Hubbard and Sewall Streets in Ludlow, around 1905-1913. Image courtesy of the Hubbard Memorial Library. Saint Paul’s Methodist Church was built here in 1905, and the first photo shows how it appeared not long after its construction. It was built on land donated by the Ludlow Manufacturing Associates, whose factory was just a few blocks down Sewall Street. In 1917, a parsonage was built to the right of the church, and can be seen in the 2015 view. Despite nearly 110 years in between the two photographs, the church is still easily recognizable. The exterior now has modern siding instead of shingles, so the building did lose some of its Victorian style, but otherwise the building is very well preserved today. 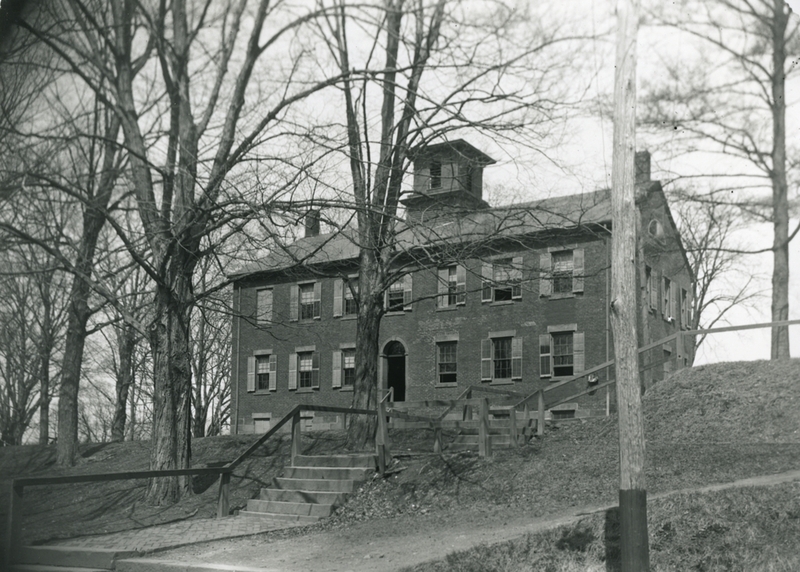 Old Academy Hall, on the campus of Wilbraham & Monson Academy, around 1900. Image courtesy of the Wilbraham Public Library. Built in 1824, this was the original building at what would eventually become the Wilbraham & Monson Academy. The school was initially founded as two separate schools: Monson Academy in nearby Monson, Massachusetts in 1804, and Wesleyan Academy in Newmarket, New Hampshire in 1817. 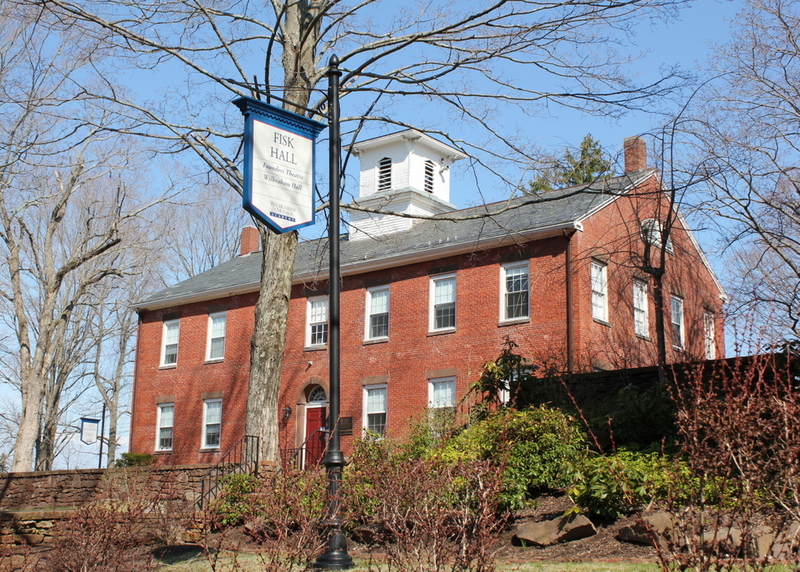 Wesleyan Academy was founded as a Methodist school, and when Newmarket was found to not be a suitable location, the school moved to Wilbraham, which at the time was an important center for the small but growing Methodist denomination. The school moved into this building in 1825, and although the campus has grown substantially over nearly 200 years, the original building is still in use. Over the years, the academy taught a number of notable people, including Massachusetts Governor and US Senator Winthrop M. Crane, industrialist and Pratt Institute founder Charles Pratt, and abolitionist and suffragist Lucy Stone. Several members of my family also attended Wesleyan Academy, including my great-grandfather in the 1880s and both of his parents in the 1840s. In fact, my great-great grandmother was less than a year younger than Charles Pratt, and likely would have known him during his three years at the school. Wesleyan Academy closed in June 1911, and remained closed throughout the 1911-1912 school year. It reopened in September 1912 as Wilbraham Academy, with a new headmaster, a new faculty, and a mostly new student body. Only one Wesleyan Academy student enrolled in the new Wilbraham Academy, so there is a bit of discontinuity with the school itself, even though the campus remained essentially the same. Another change came in 1971, when the school merged with Monson Academy and the Monson campus was closed. Today, although Wilbraham & Monson Academy uses the old Wesleyan Academy campus, the school recognizes 1804 as its founding date, the year that Monson Academy opened. The original Wesleyan Academy building has remained nearly unchanged from the exterior, and today the building houses classrooms for the English and foreign language departments. The State Street Methodist Episcopal Church at the corner of State and Myrtle Streets, around 1873-1885. Image courtesy of the New York Public Library. The same location, around 1905. 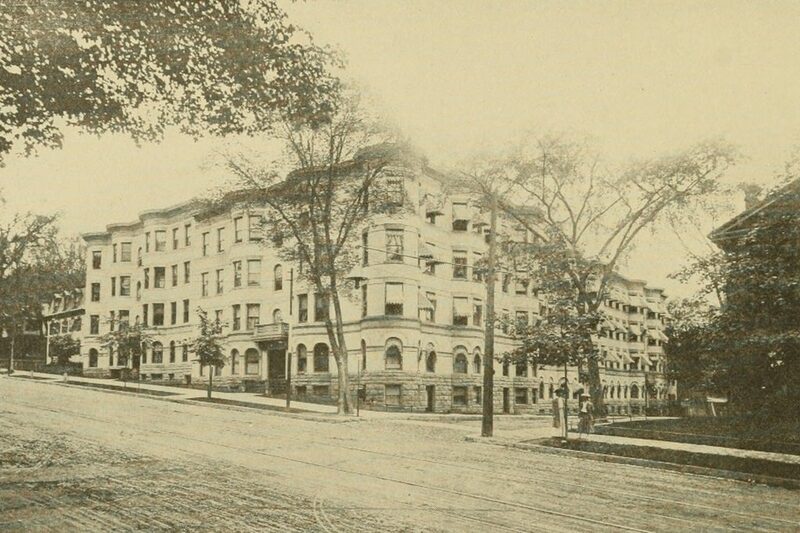 Photo from Springfield Present and Prospective (1905). 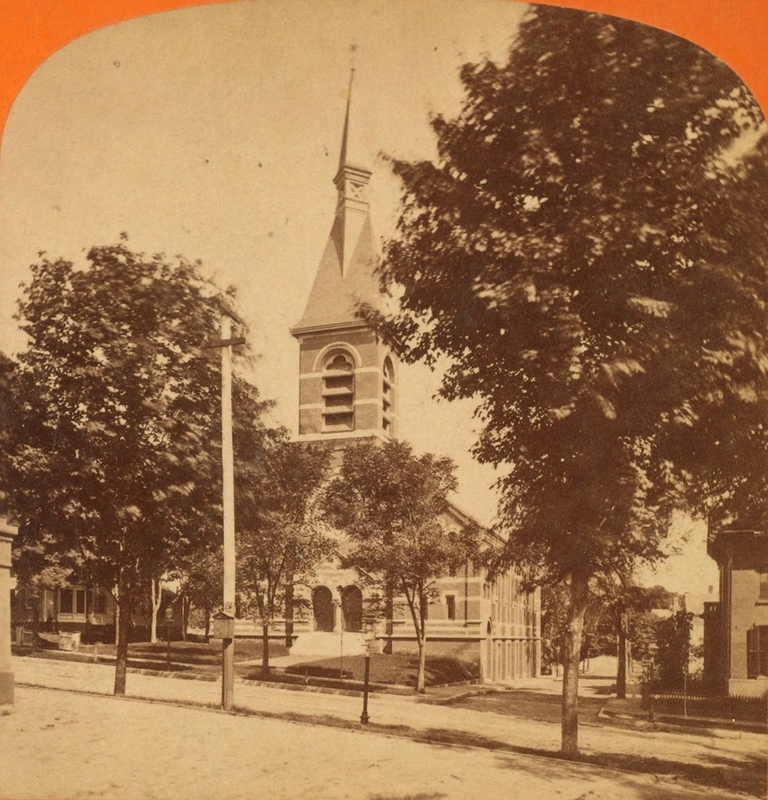 The first photo shows the State Street Methodist Episcopal Church, which was situated opposite the main entrance to the Armory, and likely served many of the workers there. The church wasn’t here for too long, however, because in 1899 they merged with another congregation, and this property was sold. 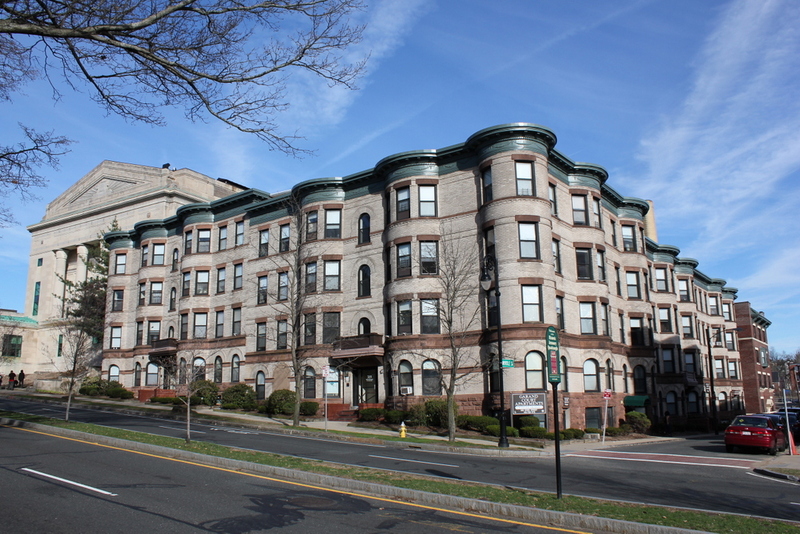 The apartment building seen in the last two photos, identified in Springfield Present and Prospective as the Oxford Apartment House, was built on the site and was completed in 1901. Given its location, it was probably home to many Armory workers, and today the exterior hasn’t really changed at all. The only major difference between the last two photos is the massive Masonic Temple, which was built in 1923 and can be seen behind the apartment building. 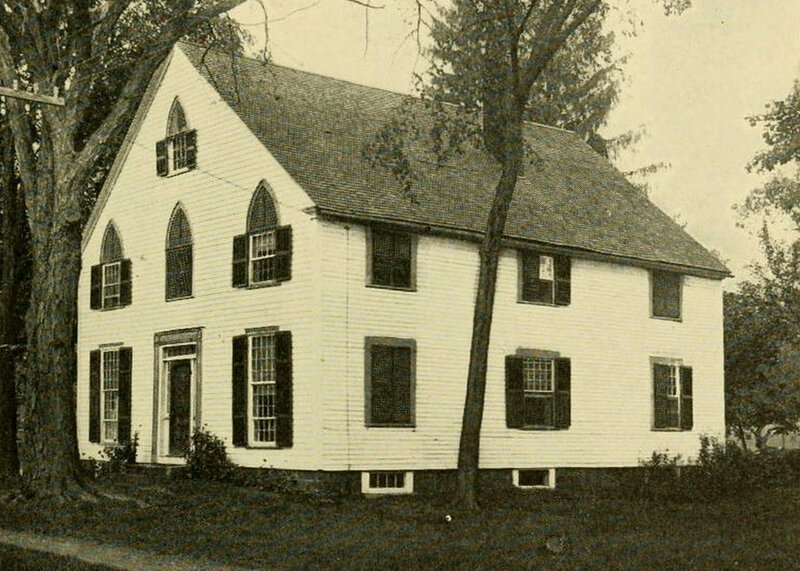 The Old Methodist Meeting House at the corner of Main Street and Mountain Road in Wilbraham, probably around 1913. Photo from The History of Wilbraham, Massachusetts (1913). The old Methodist meeting house in Wilbraham hasn’t been used as a church for over 180 years, but some of its defining architectural features are still visible, including the long windows on the Main Street side of first floor. 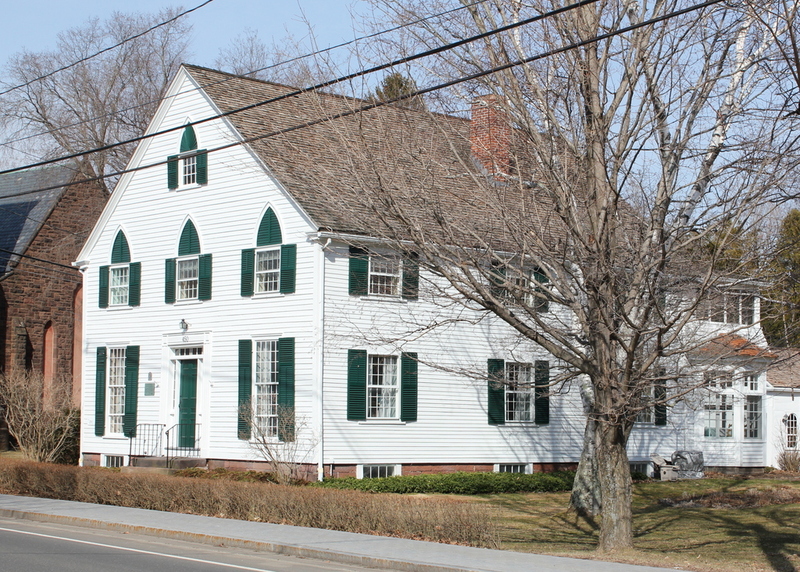 It was built in 1793, as the first home of Wilbraham’s Methodist congregation. It was used for 40 years, before being sold and renovated into a house. As built, the church only had one floor, with windows that extended all the way up the side of the building. When it was converted to a house, the second floor was added, and the windows were split, although the pattern is still noticeable here. 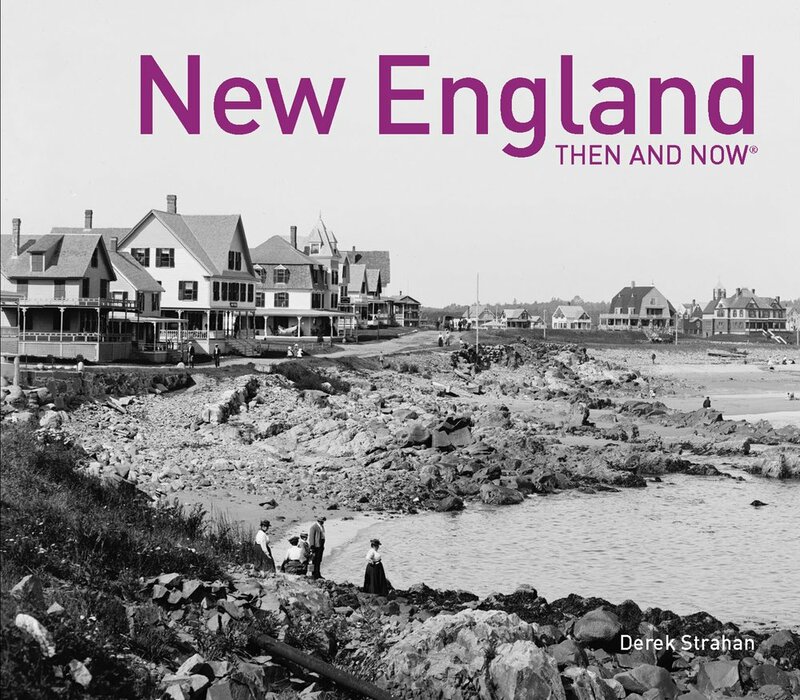 At the time that the church was built, Methodism was still in its infancy in New England. Several important figures in Methodist history visited this church in the late 1700s and early 1800s, including Francis Asbury, who was one of the first bishops appointed by founder John Wesley, and Jesse Lee, who later became Chaplain of the US House of Representatives from 1809 to 1814, and Chaplain of the US Senate from 1814-1815. During the first years of this church, the interior was rather spartan; the pews were just wooden benches, and a stove was not installed until 1815, after some 22 cold New England winters without any heat. Something as novel as an organ would take even longer; the congregation didn’t purchase one until 1850, long after they had moved to a newer church building. The Methodists built a new church across Mountain Road in 1833, and this was in turn replaced in 1870 by the stone church visible behind and to the left of the church in this photo. 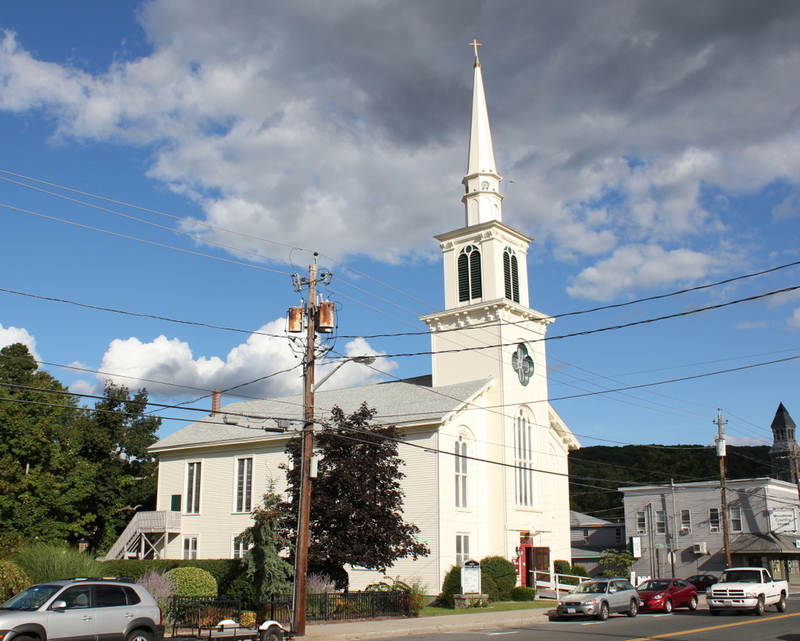 Today, the building is one of the oldest existing church buildings in Western Massachusetts, and according to the 1963 History of Wilbraham book, it is the oldest existing Methodist church in New England. Today, it is maintained as a museum by the Wilbraham Atheneum Society.